A few nights ago, I sat down with Jasmine Mangrum and Josh Schoenfeld—vice president and president, respectively, of University of Iowa Graduate and Professional Student Government—to talk about First Amendment issues on college campuses ahead of GPSG’s upcoming free speech event. 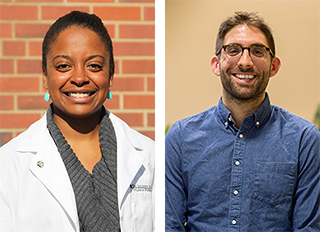 Jasmine, a second-year pharmacy student, and Josh, a fifth-year MD/PhD student in the Carver College of Medicine, shared their reasons for holding the event and their hopes about what attendees might take away from it. Free Speech Day: Challenges of the First Amendment in Modern America, keynoted by Republican strategist Ana Navarro, will take place on March 28 and feature presentations by faculty from the UI and Northwestern University, as well as Slate’s chief political correspondent Jamelle Bouie and comedian Francesca Ramsey. The following interview has been transcribed and edited for length and clarity. Why did you decide to hold this event? Jasmine: We first thought about it a year and a half ago. It was always going to be about free speech, but once November hit we realized we really needed to have this happen on campus. We wanted to have a platform to educate students. Josh: We’d like this to be the start of a conversation. No one’s going to solve the challenges of the First Amendment at this one-day symposium, but we want to educate people about the First Amendment and what it says and protects and what it doesn’t protect. We have a constitutional amendment that says you have the right to say anything you want to say, for the most part—how should we utilize that right? The first half of the day is more about what the First Amendment is and a little bit about the First Amendment on college campuses. The second half of the day is about what do you do with this right. Jasmine: It also goes back to the black community on campus with that KKK statue/artwork—whatever you want to call it. That set off a lot of fear. Some people thought it was a form of hate speech. And in the black community at Iowa there’s always this fine line where there have been conversations about free speech and hate speech. When we developed the Campus Inclusion Team, questions about free speech and hate speech and First Amendment rights came up—especially among faculty because they were concerned about how they were supposed to teach their students if certain students thought what they were saying was hate speech. Being part of that strategic team, I came to the conclusion that there needs to be a way for us to educate students about these issues. People have to know we’re a public university and have to respect that, but they also have to realize that you can’t do certain things on university property, you can’t say certain things in certain venues—and just being mindful of that and respecting the students who are here. So I think the black community definitely motivated me to do an event like this, and they’ve been the most responsive about it. It’s important that people know what their rights are but also that they respect one another. Even though you have rights afforded to you by the First Amendment, does your responsibility or your approach to what you might say change in the environment of a college campus? Josh: What’s different on a college campus is that we’re a closer community and that we should be supporting one another. We’re all in a similar situation. We’re all trying to get an education or, for faculty, trying to give an education to your students. We’re all here for a stated purpose. Jasmine: But people come from smaller towns in Iowa and this is the biggest city they’ve ever been in. When people who come from bigger cities and those who come from smaller towns come together and interact, maybe what both groups said before was ok, but when they come here, it’s completely different. Josh: I think that’s part of what college is, though. College is the first time that a lot of students are on their own, and they get a lot of exposure to people from different cultures and races and religions. It’s a time to learn from those other people and also learn how to live in a culture together. What do you believe is the greatest threat to free speech on college campuses—and how can we protect campus from that threat? Josh: I think the biggest threat is intolerance of others. You see that come from both liberals and conservatives—and not to just make this all about politics, but conservatives are calling people snowflakes and saying they’re being too sensitive, whereas a lot of the more liberal students—and you see this taking place around the country—they try to shut down talks from people who they find offensive or who they believe shouldn’t be invited to their campus to give a public talk. Jasmine: It’s even stronger because in college you find your identity and your purpose and your groups. That’s why you’re fired up in college. Josh: It’s a double-edged sword. The biggest threat would be intolerance and not wanting to hear other people’s views, but there’s also something to be said for using the resources of a university or student activity fee dollars to bring in someone who you think propagates hate speech. That’s not what the First Amendment does. The First Amendment says that person can speak. It doesn’t mean that the university has to bring them here; it doesn’t mean a student group has to bring them here, and I think that is where the balance comes in. Jasmine: If you have the majority of students saying, “I don’t like what this person puts on their site or says on TV,” it’s really difficult to say, “Let’s respect what they’re saying” when what they’re saying offends several thousand students on campus. That’s hard, and I think that is a threat to free speech on campus, but if you have an entire community saying “No,” then refusing a speaker might be appropriate. Where do you draw the line between free speech and hate speech? Josh: I think it all comes down to intentions. If a stranger comes up to you on the street, you don’t know what their intentions are. And if you know someone is malicious toward you and their intentions are obviously negative, then it comes off even worse. How do we balance this? You don’t want to limit someone’s free speech, but you also don’t want to propagate hate speech. People get offended at different levels, and I really think it comes down to an interpersonal thing. It’s a lot easier to gauge at a personal level, but now that we’re so connected by television the internet, you get a lot more exposure to people you don’t know. Jasmine: I think people are just a lot more sensitive, and I mean that in a respectful way. I feel like over the past few years, I’ve become more sensitive just because I’m more aware of things than I was before. The term people are using is that they’re “woke” now. I’m woke. And I think that’s important. It’s not a bad thing that people are being sensitive, and having emotions about issues is super important. How do you approach someone who you believe has crossed the line between free speech and hate speech? What do you do? Jasmine: If some random person comes up to me, that’s not going to affect my day. I’m not going to go off at them in the street, but if, say, Josh says something to me like that, that’s a conversation we have to have. And it’s just letting that person know how they made you feel, what they said—and it’s really important to clarify what they said because in their mind they probably said something that wasn’t offensive—and it could be tone, it could be the actual words they used, why they said it. And then just explain how it made you feel in that moment. You need to figure out where someone’s coming from because every comment or emotion that person is inflicting on you, it comes from someplace deeper. And that’s what I learned in the National Coalition Building Institute, NCBI, how to approach situations like that. It’s important to always use “I” statements; it’s important to have that dialog with someone because the more you let it pass, the more it boils up, and that can ruin a relationship. If it really means something to you, you should talk about it. Josh: Yeah, if we’re very good friends, we can easily have that conversation. It’s always a little awkward, but if you know someone, you’re able to have that conversation and have mutual respect for each other. It’s a lot harder when you’re talking to someone who might have hurled a slur at you or something. Jasmine: And it is hard, but you see videos of people confronting people. I see more and more of that because people are realizing we have to be allies, which I think is super important as well. But you have to feel comfortable doing that. On campus I feel comfortable enough that if something bad is happening, I’m going to say something. Is the university doing anything that can help? Are there places where we can be better? Josh: I think the university has been pretty neutral on free speech. Jasmine: Because it’s a public university. Josh: Yeah. They do have rules and regulations, and the administration denounces acts of hate speech on campus when they’ve happened, but in general they stay pretty neutral. It’s more the university community that can do something. The main thing is maintaining a dialog. You might have views that collide with somebody else’s, and that’s ok if you discuss it in a respectful, academic way. I think that’s something a university can do really well. It’s up to students to do this as well as up to the faculty to nurture their students and teach them these skills. Jasmine: The university as a whole has really been pushing education and dialog sessions too. NCBI provides training to create more inclusive campuses. We work to train students, faculty, staff, and community members, about how to interact with someone who may be different from you. NCBI emphasizes how to have those conversations effectively. It’s more about the emotional parts of dialog than the academic ones, but both components are important, and you can’t handle everything with an academic sword—it should be handled with emotion as well, and I think they do a good job balancing that. What do you hope attendees will take away from your event? Jasmine: I want people to feel inspired to work as a university community and to work collaboratively. You don’t always have to agree. I think that’s the problem that a lot of people have. They think that you have to agree and if you don’t agree that you can’t be friends or you’re on one side or you’re on the other side. I think we’ve created a lineup that educates people about what the First Amendment is and how we deal with that on campus. We brought in some comedy, some commentary, and we close with someone who talks about political activism and being leaders in our community. That’s what it all comes down to: How can we as students be leaders in our community, motivate others, utilize the rights we have but, like Josh said, not put people down in the process? Josh: I think there are two really big things. One would be to educate people about the First Amendment. Many people don’t know what it actually says, what it is, what it protects, what it doesn’t protect, and how you can use that tool. The other main thing is not to sway someone in one or another direction but to open up a dialog on campus so that people feel this is a conversation that we can have. There are many different sides to this argument, and it’s something that people can talk about openly in a calm, collected, respectful, academic way, rather than two or more sides just yelling at each other. We’re looking forward to it.